So I’m dropping this post to just keep this blog alive. It’s been a long time but I figured I would post on two things of relevance to me and probably you. Remember Benton Harbor, remember the uprising (note the traditional media would have called them riots), remember the community organizing in the aftermath (of course not, no one reports on organizing). Well Reverend Pinkney one of the major community leaders in BH is having charges brought against him. The people of BH are still backing him and I’ll keep you updated on what I hear. It’s amazing how some voting fraud cases actually end up being prosecuted, go figure. Thanks for the heads up Mark. 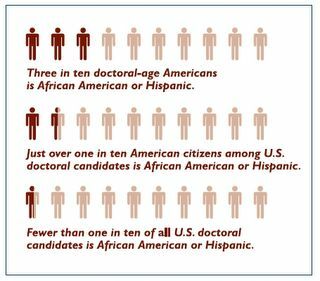 The Woodrow Wilson National Fellowship Foundation recently released its report on diversity and the PhD. The report basically outlines that there has been an increase in percentage of PhDs for the Black and Latino population but Black and Latino folks still represent a very small minority over all. You can read the report here.